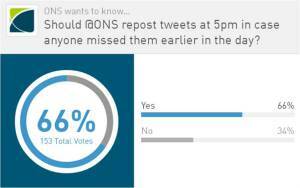 Just before Christmas, you may have seen a quick poll asking whether @ONS should repost tweets at 5pm in case anyone missed them earlier in the day. 153 votes were cast and support is clearly in favour of doing something. Wanting to make sure whatever we do works for the majority, each day we’ll auto schedule a few choice tweets again at 1730 for those that missed them earlier in the day. Alternatively, if you’d like them all at the end of the day, you can sign up to our email service. As always, thoughts very much welcome.